Posted On December 24, 2014 by Team iCynosure. It was high time that my hair did some talking and so I finally opened the door to Lakme Absolute Salon to experience a much-needed hair makeover from their show-stopping collection. With constantly re-bonding my hair over the last few years, I wanted a different yet straight fall-look that hugged my face. As I headed for the Salon in Bandra a thousand thoughts crossed my mind. But I was very sure about 2 things, one was that I wanted to maintain the length of my hair and two I did want to get side bangs. As I arrived at the salon, I was greeted by the Salon Manager Divya who ran me through a series of understanding my hair type, texture and what I’m looking to experiment with. She then introduced me to one of the senior stylist Santosh and we ran through the catalogue of styles and shades. After understanding what each show-stopping style entails and the way it would probably look on my face shape and skin tone, we went about choosing the cut and colour. I chose the ‘Helix Flair’ from Illusion without the hair highlights, but instead with a global colour. I really loved the style for two main reasons; one its a straight cut with the style hugging my hair and second for its forehead side bangs. The style is a high impact - minimalistic maintenance style which is most necessary for someone like me who has her hands full with a little girl at home needing more than necessary attention. So yay, I was ready to experiment with a really fresh girly style with a global intense mahogany colour for standing out without being strikingly different that was especially tailored for me. Santosh, my stylist for the experiment was amazing with guiding me about the steps, what he was doing and how long it was going to take. We first began with washing my hair to get a gorgeous clean hair to work on. We skipped the conditioning and headed straight for the styling console. He did ask me if I wanted to go for the cut before or after the colour application and as I preferred post the colour application and hair wash, we proceeded with the hair colour. 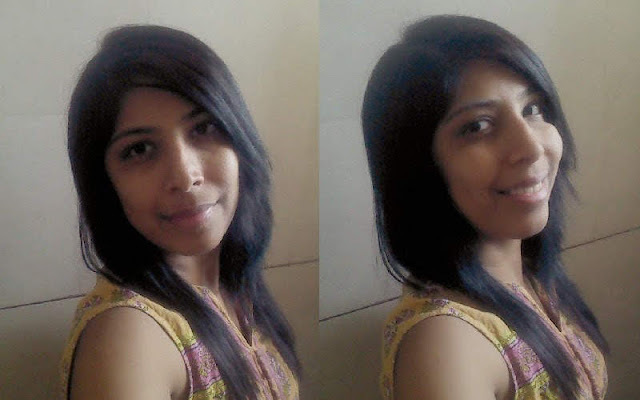 Due to the fact that my hair has been treated numerous times, read hair straightening and rebonding; Santosh kept checking my hair for elasticity and density at every step of the way. Once my hair was covered in colour, there was a wait period of about 40 minutes, throughout which he kept checking my hair for the colour consistency and dryness. If was such an amazing experience with personal detail to attention that I didn’t have to worry about anything at all, especially as I was in expert hands. Once Santosh was satisfied with the colour, off we went for the shampooing and conditioning. A great blow dry later, he was snipping my hair just like an expert rendition of musical delights. Once satisfied with the outcome, he generously set my hair with a hair serum and voila I saw a new improved in staring back at me from the mirror. I was so self-obsessed by this time that I completely forgot to take any pictures. Now for those who want a lowdown on the show-stopping styles. What are the styles one could experiment with? There are three basic styles; Illusion, Metamorphosis and Moulin Rouge. Each style has 3 sub-styles from which you could choose. I chose the Helix Flair from the Illusion style. What would the cost be for one of the styles? The cost of most styles depends upon the length and thickness of one’s hair in addition to the style chosen and the steps involved. The approximate cost for the Helix Flair would be around INR 6-7k. How much time would one need to spend to get the style? Depending what style one chooses, it could take anywhere from 2.5 to 4 hours. I spend an amazing 3 hours at the salon to go from normal to show-stopping. What is the after styling care one needs to ensure? Always go for a good quality colour protection shampoo and conditioner to ensure the colour remains warm and doesn’t bleed off. Also, remember for colours in the red family, they bleed a little bit for the first few washes so do not be alarmed. To say the least, I absolutely loved my experience at the Lakme Absolute Salon. The stylists are extremely professional, they keep in mind your requirements and incorporate your suggestions into the styling. Santosh was simply amazing as he not only tailored the style to my wanting but also kept me updated on what was happening to my hair every step of the way. He also kept dishing out simple yet important tips to care for my hair post the styling to keep it looking as gorgeous as ever. Will I use the service again? Definitely! Will I recommend the service to friends? Sure, Yes! To know more about Lakme Absolute Salons and the Show Stopping Hair Makeovers join their Facebook page. And let me know in the comments which style would you like to flaunt.